Now that the temperature is getting warmer, kids want to spend more time outside, and we want to let them. But it’s fun when we can add a little bit of learning to that play time, too. Next time you need some new art supplies for the yard, why not make your own sidewalk chalk? 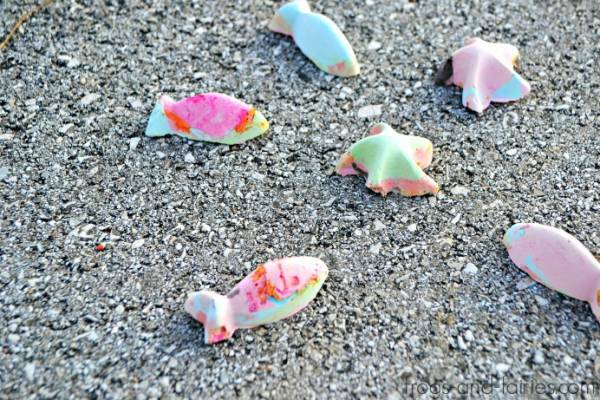 Frogs and Fairies has a recipe for color-changing sidewalk chalk (meaning more than one color is mixed into a mold so the color changes as you draw with it). It’s a pretty simple process, you can make whatever colors you want with whatever paint you have, and it’s easy to make a lot in fun shapes for party favors or a big group of kids to play with.